I am guessing that a few of you kinda like my blog and the ideas that are shared here by me and by other Moms who are just doing the very best that they can each day and having fun with it along the way. The Power of Moms Blog Contest? 3. Give yourself a big high five from me! You can nominate up to three of your favorite blogs. The top 10 blogs with the most nominations will be in the running for the contest. Not because I think I should WIN-win...(There are like a million amazing blogs out there that leave me woefully in their dust,) but BECAUSE I think the content and message found here on my blog would be helpful to many other Moms out there like yourself...Moms of all races, religions, marital status, etc who just haven't found their way over to my site yet! then please take two seconds to nominate my blog! It'll take every single one of you to make this happen, so please, help a sista out! Good luck, Jocelyn! 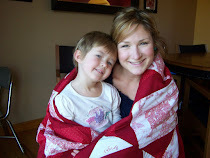 I'm headed over right now...Yours is a blog all moms should visit regularly. I nominated you! Thanks for your inspiration, Jocelyn! Done deal. I can't think of a blog I would rather nominate! Just did it! And it's because I mean it! Done! I LOVE your blog and I LOVE you!